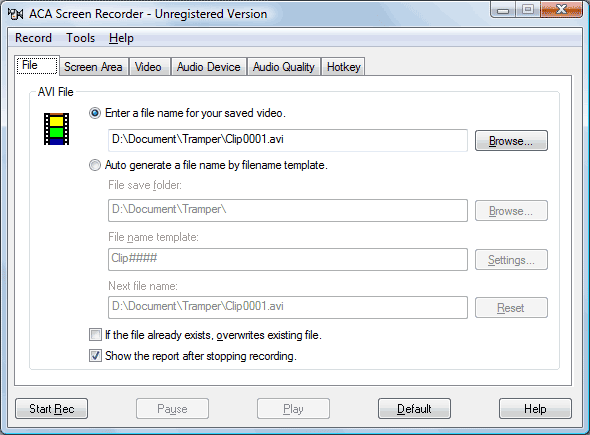 ACA Screen Recorder is a windows screen recording software, it captures the action from your Windows screen and saves it as a standard, easily edited, AVI (Audio-Video Interleaved) movie file. This format can be played under Windows, as well as the Internet, unlike other programs that use proprietary formats that may need special viewers and be difficult, if not impossible, to edit. Sound from your system microphone or other media player is also recorded. * Mouse cursor recording can be turned on or off, true shape of the cursor is recorded.